I have genuinely been trying to get there for months, but never quite did. So I was happy to be able to make last night's Manchester Social Media Cafe held in the subtropical microclimate of the BBC cafebar. 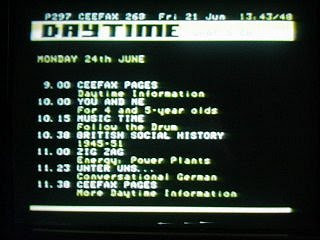 I especially enjoyed Maria Ruban's film The Joy of Ceefax and Tandot's wickedly-executed game of Ceefax bingo, both of which served as my initiation into the bewildering world of Ceefax. I actually got very nostalgic for the British childhood I never had. And I now understand the cultural significance of Bamboozle. Hooray. There is another opportunity this weekend for those of the social media persuasion to enjoy chatting amongst themselves. Labour blogging guy Mark Hanson has organised a political blogmeet for this Saturday at 4:30pm at Nexus Art Cafe on Dale Street, in the red room off to the side. Mark says: "This is largely social/informal but we also have an open invitation to ask for more help from HQ in terms of access/info/content as well as thinking of things we might want to work on together to create an impact." All are welcome. I am working with a couple of potential sponsors to organise a regular old Manchester blogmeet this summer, but it looks like it won't happen until August now due to holidays and MIF-related calendar overload. Watch this space. Also have some riotously exciting Manchester Blog Awards news to announce soon. "The open nomination period has begun and will be open until July 31. You can nominate your own blog or it can be someone else's blog, as long as you think it's browse-worthy. Whilst we would love to feature blogs dedicated to heartclogging fast food, we have decided to restrict our blog categories to mirror the Dazed Digital categories; fashion, music, photography and arts and culture. Dazed & G-Star will be shortlisting 15 blogs from each category which will all be put forward for a public vote. The winner of each category will be featured in the Dazed October issue and will also receive £500 worth of G-Star product."